Julius Caesar Act III scene ii | "Granny Beads and Grocery Store Feet"
One would have to be in a coma or outer space to have missed the monumental scandal surrounding Penn State’s football team. In brief, for my sub-rock dwellers, former Penn State defensive coordinator Jerry Sandusky was accused, then convicted of multiplied multitudes of sexual assaults on young boys who came to Penn State’s campus to participate in Sandusky’s Second Mile football camp. If every accusation against Sandusky — not just the ones he was convicted of — is true, he is likely to be one of the most prolific pedophiles since Giles de Rais. Sandusky preyed on these young boys for two decades, but in the end, he is not the only monster in this scandal. Penn State’s athletic director and the school president were found by an independent investigation to have covered up the accusations and kept the entire series of events under wraps for that same twenty year period. As a result of their complicity, the NCAA today imposed the most severe penalties on a university sports program since Southern Methodist University received the “death penalty” in 1985. Penn State — one of the proudest and most storied football programs in the history of collegiate football — is banned from post season play (no bowl games) for four years, is fined $60 million dollars ( roughly the gross receipts of one year of Penn St football), loses 20 scholarships for four years, must spend five years on probation, and, most crushingly to the school’s historical legacy, must void 111 football victories. Essentially, the NCAA is saying in the eyes of the record books, Penn St went 0’fer for the last 14 years. The final penalty — voiding the wins — does something even more painful to the Penn St family, it drops legendary coach, the late Joe Paterno, from the #1 position of all time Division 1 wins. Joe Paterno, who died of lung cancer (or a broken heart) in January, was a football coach at State College of Pennsylvania for 61 years, over 40 as the head man. To put that in perspective, he was coach for more years than my parents have been alive until their next birthdays. JoPa was more than a coach; he was an institution. Over six decades, he made his mark by “winning the right way.” Penn St was never seriously investigated by the NCAA because no one saw a need. The entire country knew that JoPa ran a squeaky clean program. Other massively famous college coaches such as Bear Bryant, Barry Switzer, and Pete Carroll are all known to have cut corners in their programs so they could consistently be on top. JoPa made his reputation by NEVER cutting corners. In 61 years, Paterno graduated more of his players than most other big time football programs. He always claimed he was more interested in molding young men in to adults of character than he was wins and losses. When he became head coach in 1966, he announced his “Grand Experiment” to blend academics and athletics in ways no other major college sports program ever had. In large measure, he was wildly successful and through the years, his players and former players breathed his name like something holy. Besides being the winningest coach, JoPa was also known as a tremendous benefactor and philanthropist for the university. Over his years as coach, Paterno and his family gave MILLIONS of dollars to Penn State, not just for sports, but to further academic excellence as well. 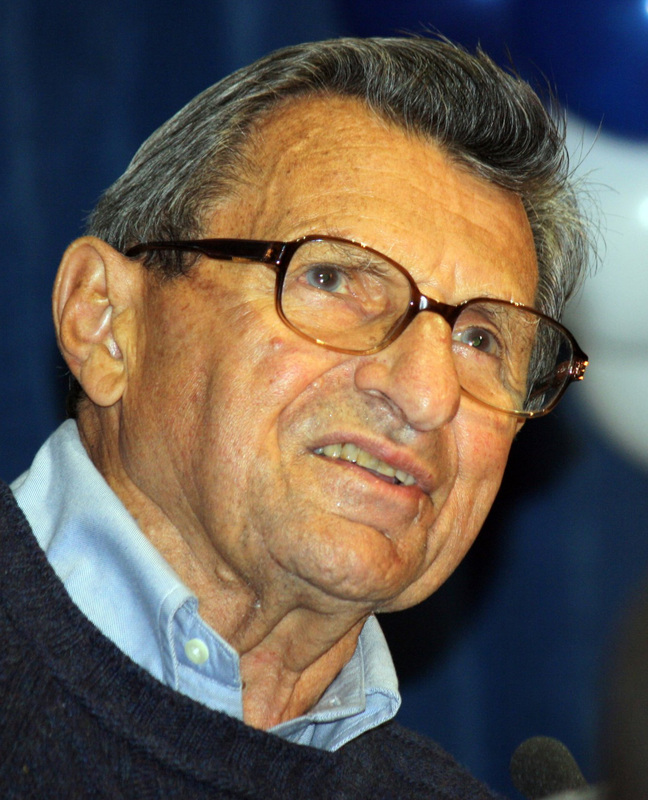 In 1997, Penn State recognized Paterno’s contributions to the university’s academic programs by renaming the school’s library — the heart of any academic institution — after the coach. Unfortunately, none of that matters anymore. See, JoPa wasn’t just a coach, he was an educator, and educators at all levels from preschool to undergraduate college live by a code. Doctors have the Hippocratic Oath. Lawyers have the oaths before the Bar Associations. Teachers have a three word phrase — in loco parentis — Latin for “in the place of parents.” Educators are given charge of parents’ most important and beloved possession, their children. We (and I say we as I taught for 15 years) are supposed to guard those young people as if they were our very own. In many cases, we spend more time with those young people than the parents do. For coaches, this is especially true. For all his speaking of a Grand Experiment, for all his claims of “winning the right way,” and for all his wonderful acts of giving, Joseph Paterno — head football coach extraordinaire — forgot in loco parentis. As a result, AT LEAST 56 young men lost their innocence to a predator on his watch. He kicked the can on down the road by telling his boss the AD and HIS boss the school president what he knew, but educators have a higher calling. We don’t just WIN the right way, we DO THE RIGHT THING. He did what he thought was all he needed to do — he fired Sandusky and told what he knew, but that’s where he stopped. Once JoPa saw his information had been ignored, he had a DUTY to tell that story until someone listened and acted. If that meant going to the police himself, that’s what his duty as an educator demanded, but he didn’t. Sadly, for all the good Joe Paterno did, none of it will likely be remembered and what is, will be forever tainted by the scandal. All his good is now eaten up by ONE bad call. A generation of players will remember him fondly, but the lasting legacy he had worked so hard to set up is dashed. 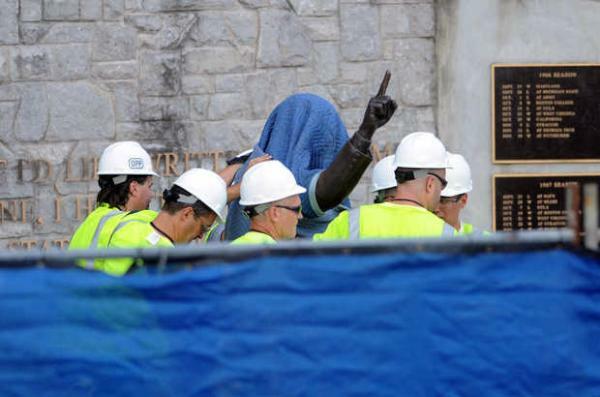 His beautiful statue was ripped off the wall of Beaver Stadium and placed in cold storage, perhaps forever. He is no longer the winningest coach. A lifetime of good undone by a wrong decision. JoPa was a good man who made a bad choice. I have never been a fan of Penn. State in any way, much less JoPa. I thought he was a scoundrel before he actually proved me right by keeping quiet about Sandusky. As far as I’m concerned, the other men that also lost their jobs, including JoPa, were no better than that animal that preyed on the young boys. They should all rot in hell!!!!!!!!!! I don’t think the punishments for the school was enough. But, I am glad they lost what they did. Sandusky deserves to be raped in hell for the rest of his sorry life. JoPa should already be there waiting……..